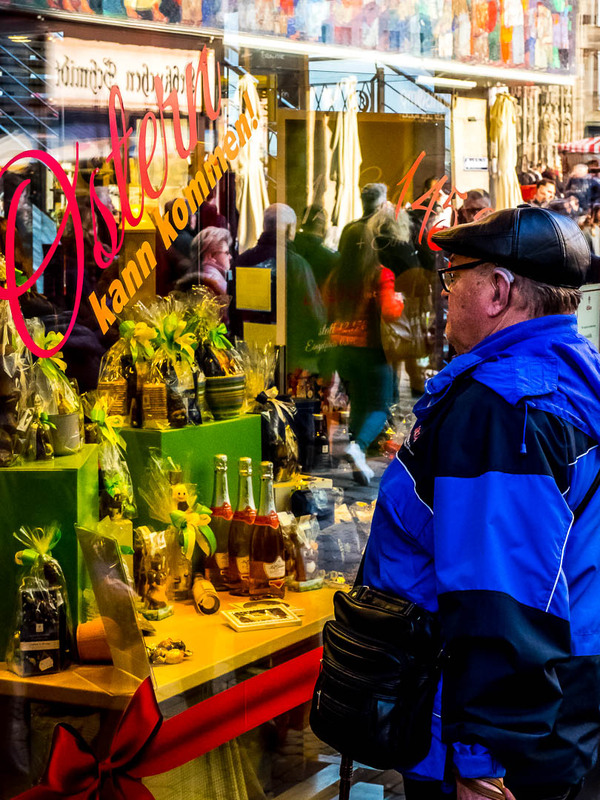 How ’bout a small German lesson – “Ostern kann kommen” – reads this shop’s window and attracts (chocolate starved) onlookers. I personally take a good tasty Bratwurst any day over a chocolate Easter bunny. But that’s just me. Photo was taken with the Olympus OM-D E-M1 with the Oly 12-100 F/4 Pro Zoom, image specs 1/320 at f/8 and ISO3200 (still form that infamous series), focal length was 38mm (76mm full frame equivalent). If you still look for inspirations around photography for the Easter weekend, check out the tips in my Learning Center . Easter weekend a the small trip to Austria was awesome. Thanks :-)! Definitely! Savory over sweet everytime! I also prefer a tasty Bratwurst over an Easter chocolate bunny! I’ll take a brat, a beer, and an Easter bunny hahahaha! Way to go, Kristin, thanks 😀! Hope you have a great Easter weekend with your family Marcus. Thanks, Marion, it will be a good weekend! Happy Easter to you and yours as well! Happy Easter Marcus. Hope you have a wonderful time with your family. I’ll also take the Bratwurst. Have a good Easter, Marcus.